Lowe's continues to trail rival Home Depot. Home Depot (HD - Get Report) hammered rival Lowe's (LOW - Get Report) , again. On Wednesday, Lowe's badly whiffed on earnings, reporting first quarter results of $1.03 a share compared to Wall Street forecasts for $1.06 a share. Total sales of $16.9 billion came in line with analyst estimates. But, same-store sales, a key retail metric that measures sales from stores open longer than a year, rose 1.9% vs. estimates for a 2.6% increase. The company reiterated its full year sales and earnings outlooks, excluding one-time items. Shares dived 3% to $79.83 in the session trading. Lowe's dour quarter stood in stark contrast to Home Depot, it's larger competitor who continues to thrive amid efforts to improve its website, customer service and product offerings. Home Depot's first quarter earnings grew 16% to $1.67 a share, easily beating Wall Street forecasts for $1.52 a share. Same-store sales rose 5.5%, ahead of analyst projections for 3.9% growth. Home Depot saw growth in both the number of transactions and the average amount spent by shoppers. The company lifted its full year earnings outlook to $7.15 a share from $7.13 a share previously. Home Depot said all merchandise departments delivered sales increases. Sales from contractors, which Home Depot refers to as pros, were stronger than those from typical consumers. Online sales surged 23%. Lowe's struggles are particularly disappointing in light of still favorable macroeconomic trends for home improvement retailers. Home Depot is still beating Lowe's. So far, the U.S. housing market has withstood the rising interest rate environment and subsequent decline in housing affordability. 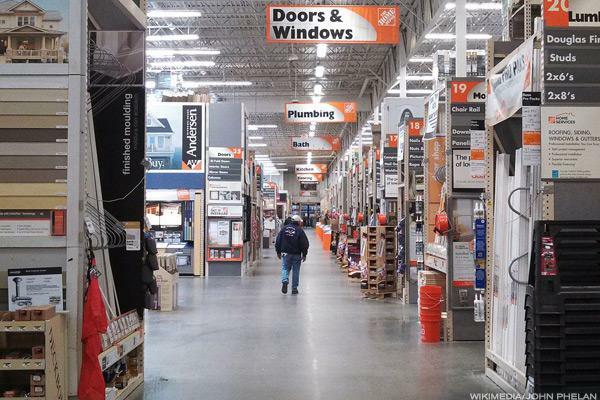 In turn, home improvement retailers such as Home Depot have continued to thrive as existing homeowners renovate their homes -- which are rising in value -- and builders try quickly to bring on badly needed supply. Existing home sales hit their fastest pace in a decade, climbing 1.4% in the first quarter to an adjusted annual rate of 5.62 million, said the National Association of Realtors (NAR). The national median sales price increased 6.9% from the prior year to $232,100, the strongest gain in about two years. Meanwhile, the NAR's Home Remodeling Index (RMI) increased five points in the quarter to 58, its highest reading since 2015. An RMI above 50 indicates that more remodelers report market activity is higher compared to the prior quarter than report it is slower. "Home improvement spending still remains healthier than most areas in retail," says Jefferies analyst Dan Binder. "The industry is lapping the toughest quarterly comparison of the year, led by a strong February last year. However, trends remain strong as quarter to date building materials, hardware and garden supply sales (according to government figures) have grown 6.4% year over year while lapping a 10.1% growth over the same time period last year." Editor's Pick: Originally published May 24.